Ever heard of traffic shaping or Internet throttling? If not you need to read this, it could be the reason why your YouTube or favorite game is running so slow. Have you ever noticed that sometimes it takes a lot longer than usual for websites, games or movies to download or stream to your computer? Is watching streaming content a pain because Youtube is too slow? If so, you are likely the victim of traffic shaping, the latest in a long series of buzzwords that describe the traffic controlling practices used by Internet service providers around the globe. If you haven’t heard this term you may be more familiar with bandwidth throttling. Read on to learn about the difference between the two. Bandwidth throttling is the intentional slowing of Internet traffic by Internet Service Providers, ISPs. Throttling can be done at several levels of the network. Locally, system admins can control the flow of traffic to their local area networks to prevent server crashes and other impairments. On a broader scale throttling by ISP’s will control the flow in information across the Internet to the local network. They do this to control the flow of traffic and minimize bandwidth congestion. On the surface, it sounds like a good thing but its application and today’s usage often increases connection speeds only for those who will pay at the expense of everyone else. The real danger to average Internet users is that throttling can be actively targeted to include geographic regions, certain types of content (streaming video, games, etc.) and to compel Internet users to pay higher rates for faster connection speeds. Bandwidth – In computer networking bandwidth, also known as network bandwidth, data bandwidth or digital bandwidth, is a rate of information transfer capacity expressed in terms of bits per second. In application it may refer to amount of throughput available on one system. Think about it like this. The Internet is made up of millions of data servers which host websites and direct traffic. In order to access websites and transfer information your computer will make and receive requests from one or more of those servers. Bandwidth is the rate of requests a server/connection is able to maintain, throttling is done by limiting the number of those requests. Broadband providers may not block access to legal content including websites, applications, services and devices. Providers may not impair or degrade lawful traffic on the basis of content, application or service. Providers may not favor traffic from one source over another for consideration of any kind. Comcast versus the FCC – The case that started all the talk about throttling, capping and Net Neutrality is Comcast vs. the FCC. The FCC brought charges against the cable giant in 2007 following complaints the company was interfering in peer-to-peer data transfers. The FCC alleged that Comcast had significantly impaired Internet users ability to use applications and access content of their choice. Comcast eventually admitted to these practices and later amended their policies toward managing bandwidth demand. ISPs still needed a way to control the flow of information across the net in order to protect their servers and the system from overloading and crashes and this is where data capping came into play. Data capping is the practice of limiting the total amount of data transfer capacity that is available at one time. It is done in two ways, standard capping and lowered capping. Standard capping limits the amount of data transfer capacity that is available to each individual connection so that no one individual can consume the entire bandwidth. A lowered cap is a penalty or punishment imposed on a heavy consumer of bandwidth, further limiting their ability to receive and transmit data. Throttling practices vary around the world and exist even in places where Net Neutrality is the law. When choosing an ISP it is important to consider their throttling practices. A few of the more common methods of comparing connection speeds include Maximum Monthly Payload, Maximum Utilization Percentage, Throttling Percentage, Equivalent Connection Bandwidth, Cost Per Unit Payload and Unthrottled Connection Cost. The latest incarnation of computer network traffic management is called Traffic Shaping, also known as packet shaping, and is ultimately just a front for throttling. Traffic shaping is the practice of holding up data packets, your data or streaming content, in order to force them to comply with a desired Traffic Profile. It is used to optimize or guarantee performance and/or increase available bandwidth by delaying packets that don’t match the profile. At face value the practice is sound, however, if you haven’t by now had the idea, this practice is one that gives preferential treatment to certain types of data over others and can be used to impede the free flow of Internet traffic. Internet Packets – Data is transferred across the Internet in packets. The packet is a bundle of information, which includes your IP Address, the IP Address of the destination and the Payload. The Payload is the data, information that you are sending or receiving. In the most basic terms the speed of your Internet connection is measured by the number of packets that can be sent or received, and the speed at which they are delivered. The two most common types of traffic shaping are application-based shaping and route-based shaping. Application-based traffic shaping uses fingerprinting tools to identify applications, which may need or be subject to shaping policies including but not limited to peer-to-peer throttling. Route-based traffic shaping uses previous-hop or next-hop information to segregate traffic for throttling. In practice, traffic shaping is used as a means to control the flow of traffic to an Internet node in order to prevent latencies, overloading and crashes. It can be implemented in a number of ways but in every case it means delaying the transfer of information packets, usually at the fringes of a network in order to control the flow of data entering the LAN. The basic functionality is simple. The shaper impedes the flow of traffic into or across a network until it matches the profile established by the Traffic Contract. The Traffic Profile is a series of measures that occur over a period of time. The Traffic Contract is a set of specifications, the profile, put forth by a website or application. Any incoming traffic that wishes to use a network must first identify what kind of traffic it is and its performance requirements in order to gain access. If the network is unable to transmit the data in accordance with the contract it is held up until such time as it is possible in order to ensure proper connections are maintained. Traffic Shaping has many practical applications and can increase the quality of service for many types of Internet applications. The ISPs in particular enjoy this method of traffic management because it affords them the ability to know what traffic is moving through their networks, what Internet users are doing and then use that information to provide a wider range of targeted products and up-sells to their user base. They look for specific markers such as which ports are accessed to target potentially high traffic use websites for buffering. Regardless the reason traffic shaping raises a number of concerns for Internet users. The first is privacy. 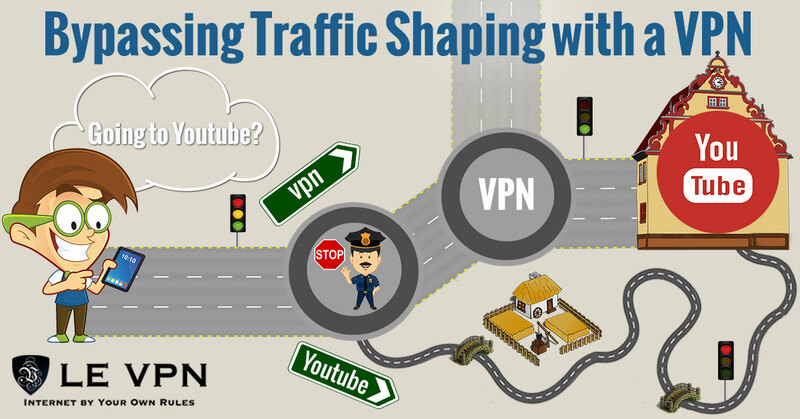 Traffic shaping and the monitoring of traffic is an invasion of Internet privacy. The second is the affect it has on your web surfing and connections speeds. How Throttling Affects You – If you are accessing a website or application subject to throttle shaping, and it is your primary use of the Internet or even just above average compared to other ISP customers you could be throttled and/or subject to lower bandwidth usage… which means you are not getting the full use of the services you are paying for. If you think or are not sure if your ISP is throttling your connections it is easy to check. There are a number of free websites on the Internet that will do it for you. Think about this. Traffic shaping and throttling is a method by which the ISPs can avoid investing in their own infrastructure. Traffic shaping and throttling are used to control the flow of traffic across a network to prevent overloads and crashes. If there is so much traffic that there may be a crash doesn’t that mean the network is insufficient to its use? Doesn’t that mean it needs to be upgraded by its operators, the ISPs? They take your money, promise fast speeds, don’t deliver and don’t do anything to improve the situation causing Internet congestion. The way the Internet is growing the problems are only going to get worse. The only real way to avoid these practices, at least at the ISP level, is to use a VPN. VPN, virtual private network, is an Internet Protocol first created for use by large corporations and governments and now available commercially for home use. It allows remote users to connect to a local area network using the public Internet with safety and security. There are a number of benefits to using VPN, most of them secondary to the original purpose, including anonymity, encryption and secured connections. One of those benefits is the ability to bypass traffic shaping. The very nature of the VPN and how it works makes it impossible for the ISP to detect your connections which means there is no traffic contract to deliver, no traffic profile to meet, no buffering, no traffic shaping and no throttling. This is how it works. The VPN is a software protocol you download onto your computer. When you use it to connect to the Internet the connection is routed through a remote, dedicated server running one of a handful of VPN tunneling protocols. When your device (computer, laptop, mobile or other) creates a data packet, the VPN software is inserted inside where it operates to encrypt the payload and then re-packetize the original packet in an encrypted form with new, anonymous IP address information. The packet is then sent directly to the VPN server to be delivered, authenticated and decrypted at the destination. All your ISP will ever see is a continuous, encrypted, unidentifiable connection. So, to answer the question “how to bypass traffic shaping with a VPN?” the answer I have is this, easily. Providers like Le VPN support a wide range of VPN protocols suited to any need and at a cost of only a few dollars per month. The best part is that while you are bypassing traffic shaping and avoiding ISP throttling you are also filling in security gaps left by your firewalls, malware and Internet use best practices. What Kind Of Internet Traffic Is Throttled? Ironically, it is typically the most popular content and websites that are being targeted for traffic shaping and throttling. These websites and apps receive the heaviest, widest usage and would, you’d think, receive preferred treatment in order to promote its use and uninterrupted quality. Sites commonly targeted include P2P applications, streaming movies and other entertainment. Services such as streaming TV and YouTube often suffer such incredibly amounts of lag as to make them virtually unwatchable. BitTorrent is one of the most heavily throttled services on the Internet. For those of you who don’t know, BitTorrent is a peer-to-peer protocol for file sharing and represents a significant portion of all Internet traffic. It uses encryption to transfer files between clients but is not immune to packet shaping the way that VPNs are. When you connect to a VPN the connection is encrypted and protected starting with your device through the end point, invisible to traffic shaping protocols. When you use BitTorrent only the data is encrypted, not the packet, and only once the connection is made. Traffic flowing between your device and the BitTorrent website, and between the BitTorrent website and the recipients computer, is visible and subject to traffic shaping policies. Peer-to-peer applications are estimated to account for more than 50% of all Internet traffic. File sharing services like BitTorrent are estimated to account for 6% of all bandwidth use, 50% of that attributable directly to BitTorrent. Needless to say, this is a lot of Internet traffic and all subject to traffic shaping and throttling. Fortunately, BitTorrent protocols can be protected along with all your other P2P applications by simply using a VPN. Early in 2016 Verizon and AT&T were accused, incorrectly, of throttling Netflix streaming and downloads. Mobile customers complained of slow streaming and excessive buffering that Netflix itself later admitted to causing. The reason? They said it was for the customers’ own good. They were trying to help protect mobile users from hitting monthly data caps, an odd stance given the company’s views on Net Neutrality and the free use of the Internet. On one hand, protecting consumers from unwanted fees and fines for data overages is a noble gesture, while on the other it is up to the individual to decide how best to use the Internet and manage their costs. AT&T was particularly outraged as many of its customers have unlimited data plans and were never at risk of overage. Netflix is now offering a data saving feature that can be toggled on/off by each user. Streaming 2 hours of Netflix at 600 kilobits per second will consume 6 gigabytes and max out the base plans offered by most mobile carriers. Traffic shaping, Internet traffic management and throttling are realities of our every day life. In many cases, it will be impossible to avoid, instances where you are accessing or sending sensitive information such as with your bank is only one example. In other cases, it is not only your right to avoid, it is in your best interest to avoid, cases like when your ISP monitors your traffic so it can control how much bandwidth you and the websites you love to use and visit are able to use. These practices are at best an irritation, but when it results in lesser service than what you’ve paid for, diminished service or the impediment of free-flowing Internet traffic, they border on criminal. The best way, the only way, to bypass traffic shaping and throttling is through the use of a VPN service like Le VPN. The need is clear, the solution is clear, get Le VPN now.